Terry Haggerty’s vibrant wall paintings conjure nostalgic associations from the mustard yellow and avocado decor of the 1960s and 1970s, to optical art, to the precise lines of sugar icing on pastries. He combines humorous and historical references to form abstract compositions that electrify and manipulate the space around them. Haggerty applies multiple coats of paint to create sleek surfaces and utilizes simple lines which, when viewed together, create masterful geometries that seem to blend and curve each wall. British-born artist Terry Haggerty, who currently lives and works in New York, has become known in recent years for paintings that express the formalist vocabulary of abstraction in a new way. 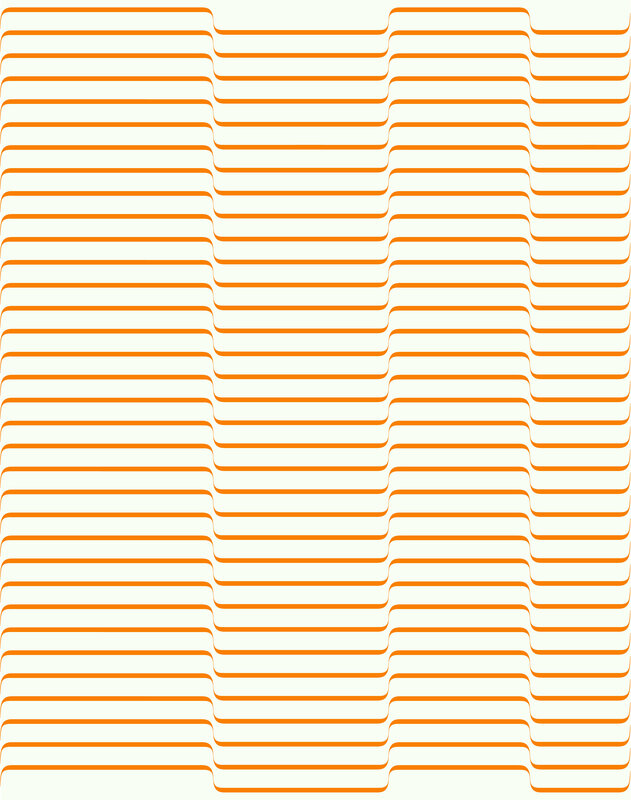 The principle of serial composition can be discerned in Haggerty’s work: light-colored stripes alternate with darker ones to form regular, often horizontal arrangements, which also have a patternlike quality due to their dense structure. 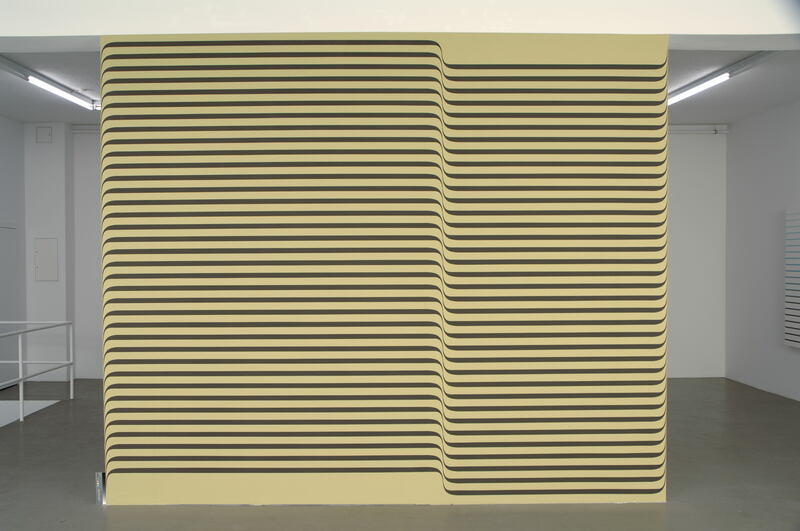 This would not seem particularly remarkable were it not for the fact that Haggerty breaks this linear formation at the edges of the painting—and occasionally also at the symmetrical center of the composition—by bending the lines in a different direction as they approach the boundaries of the painting support. This has a crucial effect on the overall pictorial appearance, in that it immediately transforms the planimetric structure of the painted motif into an illusory perception of three-dimensionality within the image. The surface seems to continue beyond the boundaries of the picture support, with the result that the two-dimensional paintings suddenly resemble painted volumes or reflect the illusory perception of a third dimension back onto the pictorial motif. 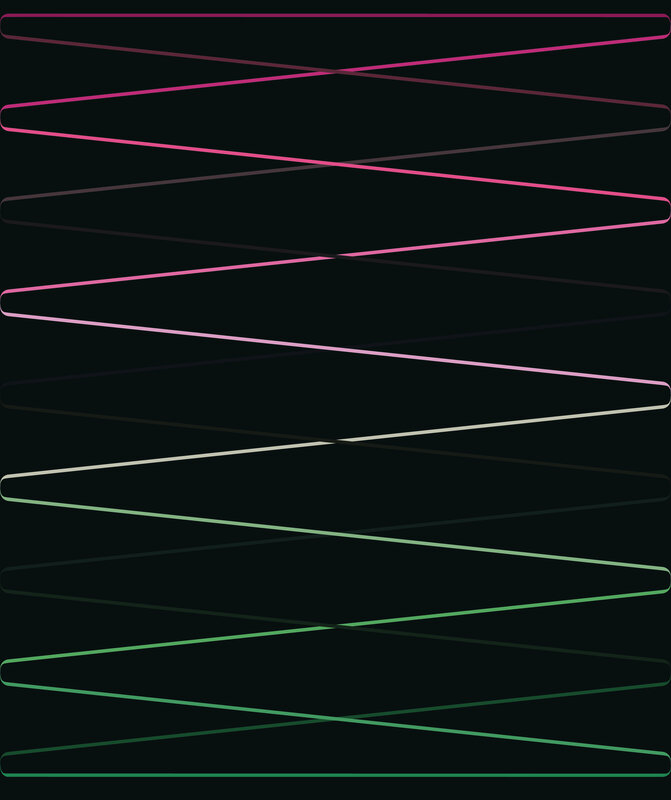 Considered and viewed from the edges, these sequences of horizontal stripes seem like layered and apparently three-dimensional planes of color stacked one behind the other. 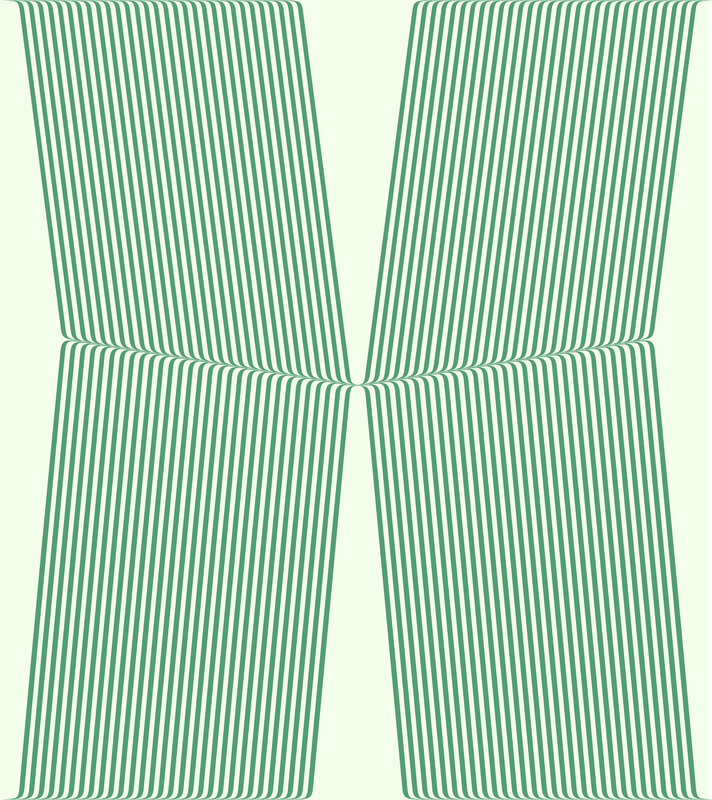 This impression is also conveyed when the lines are bent at the center of the composition, leading the gaze along a symmetrical axis as if the viewer were suddenly to be drawn behind the image. In a curious way, these works by Haggerty combine the tradition of Minimalist painting with the artistic principles and various interpretations of a form of expression that went before it—Op Art, a movement developed in the late 1950s and early 1960s that involved the use of perceptual phenomena as a creative tool. There is, however, an inherent contradiction in the aims of these two artistic trends, which are in fact divergent: nonobjective painting sought to create a spiritual space that extended beyond the boundaries of the artwork, whereas the aim of optical abstraction was to activate the phenomena of a created picture surface in order to produce specific effects within the boundaries of the image. The synthesis sought by Haggerty in his works can therefore be understood as a reduction and modified application of the formal means and possibilities offered to him by his art historical predecessors. His experience of the discipline of painting is first and foremost as a practice through which it is possible to investigate and explore the effects of planar surface and spatial illusion, of cool and warm color combinations. It is only recently that Haggerty has had the opportunity to realize his pictorial designs in the much larger format of wall-filling paintings. In this context, the installation he has developed for the foyer of the Hammer Museum in Los Angeles is his most extensive work to date. 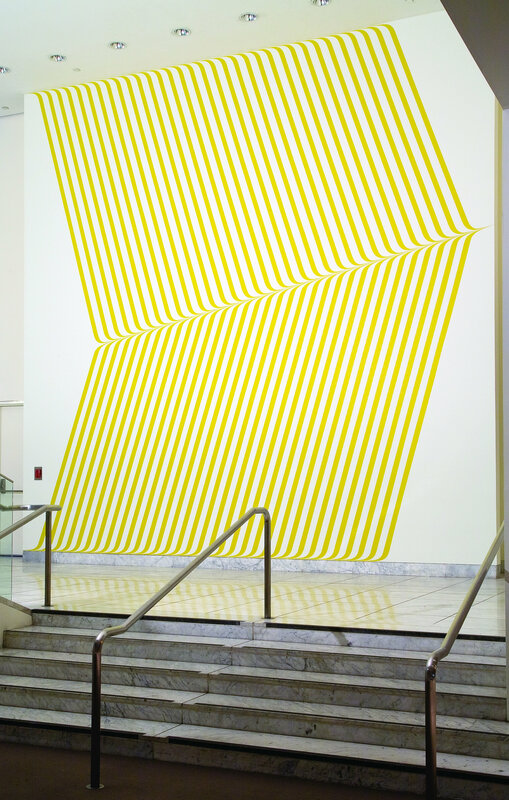 When motifs that have previously been depicted by Haggerty in a number of different painted works of varying formats are transferred onto a surface that—as in the case of the entrance hall of the Hammer Museum—involves two walls at right angles to each other, three-dimensionality becomes an increasingly important aspect. Suddenly this third dimension is no longer only an illusion within the painting but also a spatial reality in the place where the work is installed. 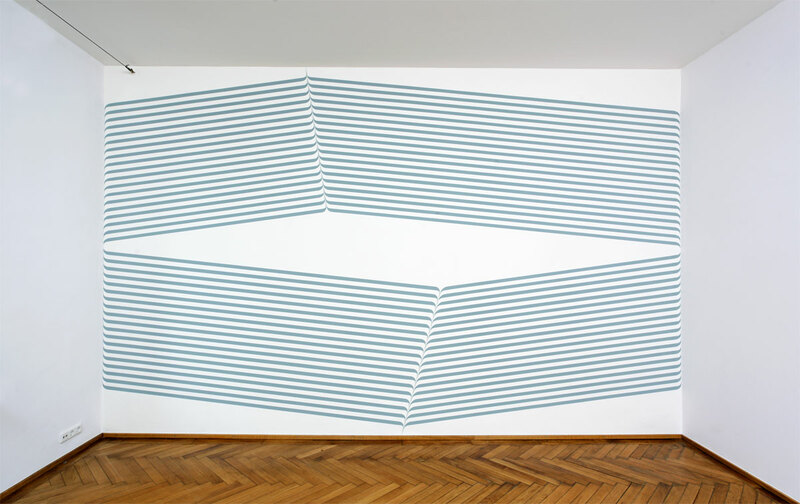 The composition of this wall-based work, with its almost monumental depiction of a progression of colored lines, prompts spectators to constantly redefine their position in relation to the image by changing their viewing angle. 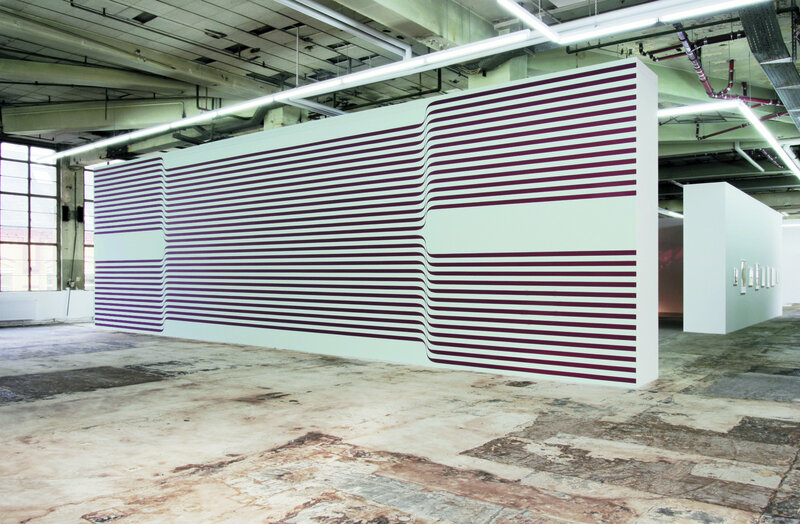 When applied to the space of an installation, the illusion—which in Haggerty’s previous works was contained within the relatively narrow confines of a classical panel painting—develops into a challenging game of optical deception that is produced and destroyed at once. The bending of the lines at the edges is now no longer merely a perceptual illusion; it occurs over the entire distance covered by viewers as they climb the stairs leading up to the exhibition space and pass by the wall work. This constantly changing perspective makes it seem as if the real wall of the architectural structure is curving; it becomes light and immaterial behind Haggerty’s pictorial foil. The composition, which is clearly site-specific, expands to include a suggestion of “space-specificity,” such is the pull of the visual stimulus that draws viewers in and involves them in a tense confrontation between perceived optical phenomena and actual bodily experience within the space. With his new wall installation, devised especially for the Hammer Museum, Terry Haggerty has created a piece that expands the scope of his abstract pictorial language; he has achieved a new synthesis of painted optical illusion and actual spatial experience. Exploiting the illusory qualities of painting to the fullest, he skillfully creates an impression of movement upon the wall surfaces, and relying on the perceptual motor skills of the viewer, his wall painting also conveys a sense of movement within the architecture itself when seen from different points of view. The spectator is given the impression of being drawn behind the painted surfaces, which seem like relief works protruding into the space. The expansion and transference of his familiar pictorial structures into this new architectural dimension give Haggerty’s latest work a distinct and remarkable spatial presence. Translated from the German by Jacqueline Todd. Friedrich Meschede is head of the Department of Visual Arts at the Berliner Künstlerprogramm at DAAD Berlin, where he curates projects with artists-in-residence in collaboration with other contemporary art institutions in Berlin. Terry Haggerty was born in London in 1970 and lives in New York. He studied at the Southend School of Art, Essex, England, and the Cheltenham School of Art, Cheltenham, England. His work has been featured in solo exhibitions at Kuttner Siebert, Berlin; Grimm Rosenfeld, Munich; Konsortium, Düsseldorf; Aschenbach & Hofland, Amsterdam; and Riva Gallery, New York. He has participated in group exhibitions at Galerie Max Hetzler, Berlin; Sikkema Jenkins & Co., New York; the Aldrich Contemporary Art Museum, Ridgefield, Connecticut; and Artists Space, New York. Haggerty’s work was also included in the Prague Biennale (2003) and the Venice Biennale (1994). This is Haggerty’s first solo exhibition in an American museum.